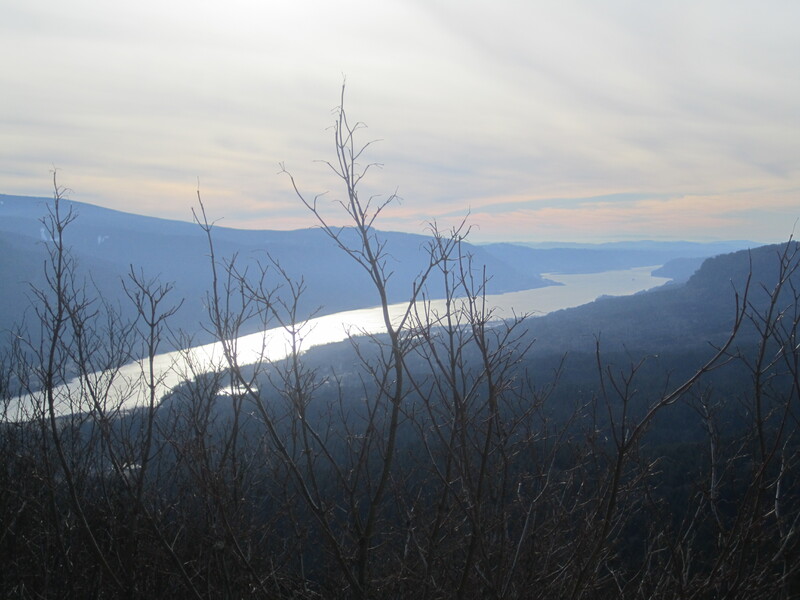 The western end of the Columbia River Gorge is home to many fine destinations. 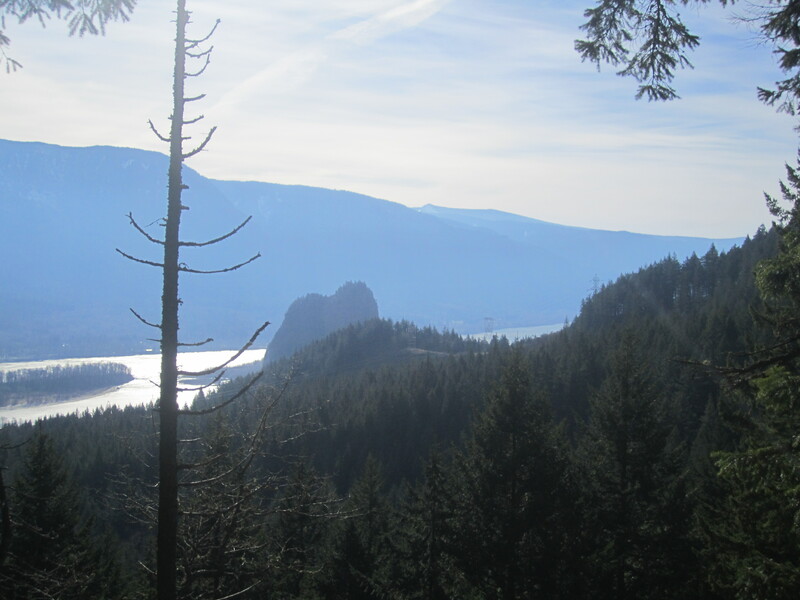 One of them is the Hamilton Mountain Trail in Beacon Rock State Park. 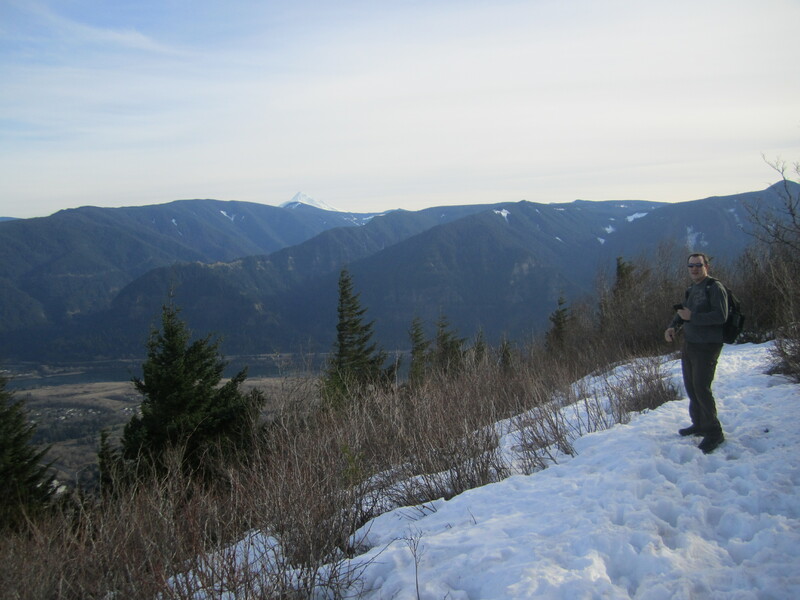 My friend Rich and I headed out there yesterday on an unusually warm February day. 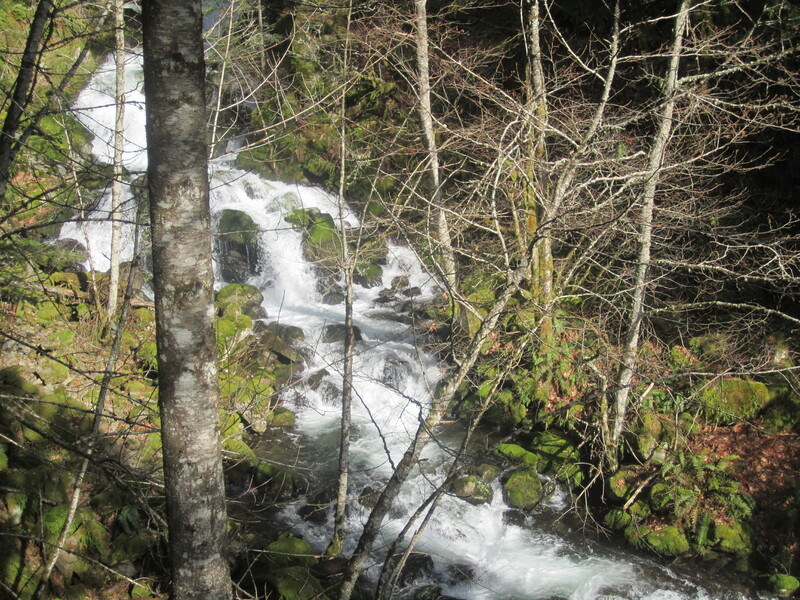 As soon as we arrived, I realized that warmth would be tempered by a typical Gorge wind. 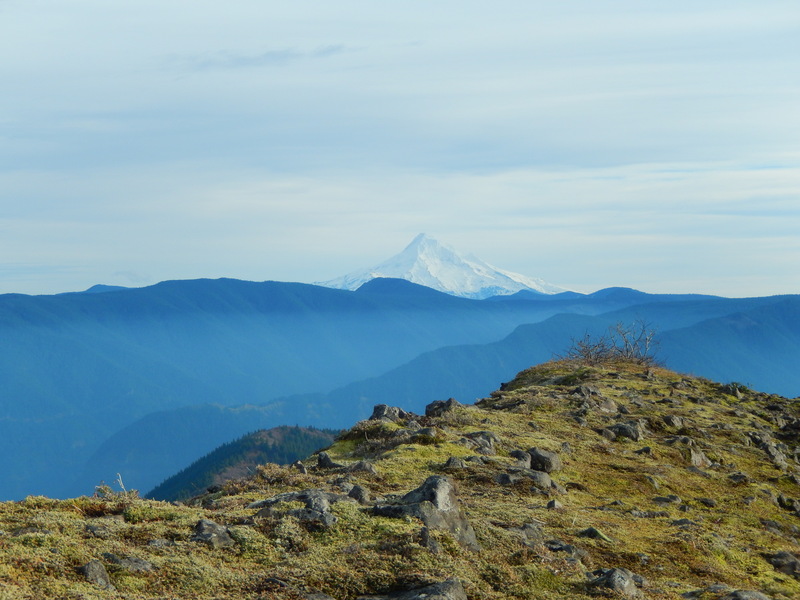 The trailhead was full of cars, so I knew this would not be a solitary wilderness experience. No worries. 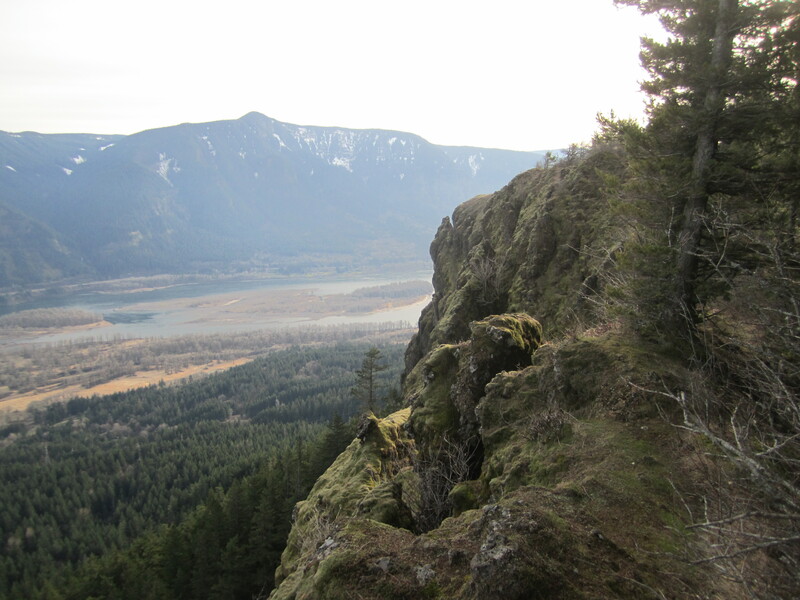 I had done the trail years ago with my wife during the summer, and I knew there were some great views. 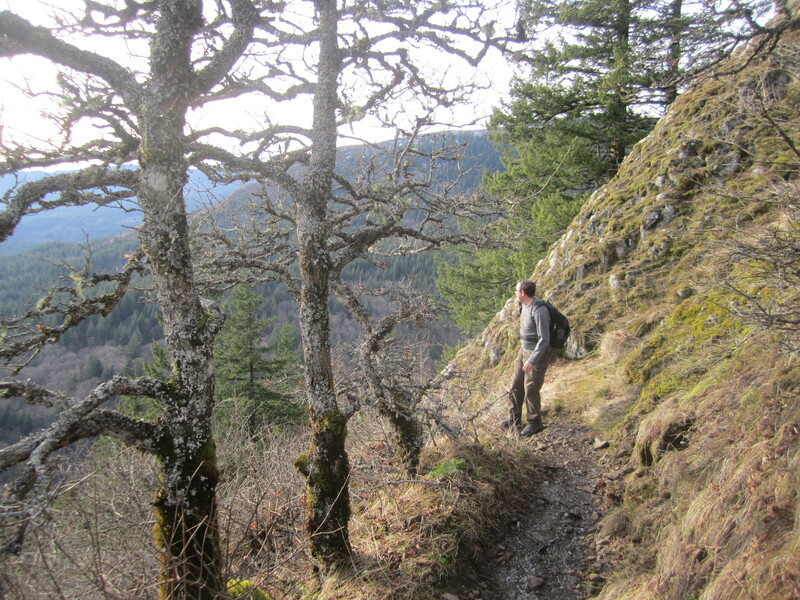 It offered a two thousand foot vertical gain, which seemed solid, but not extreme, even in February. 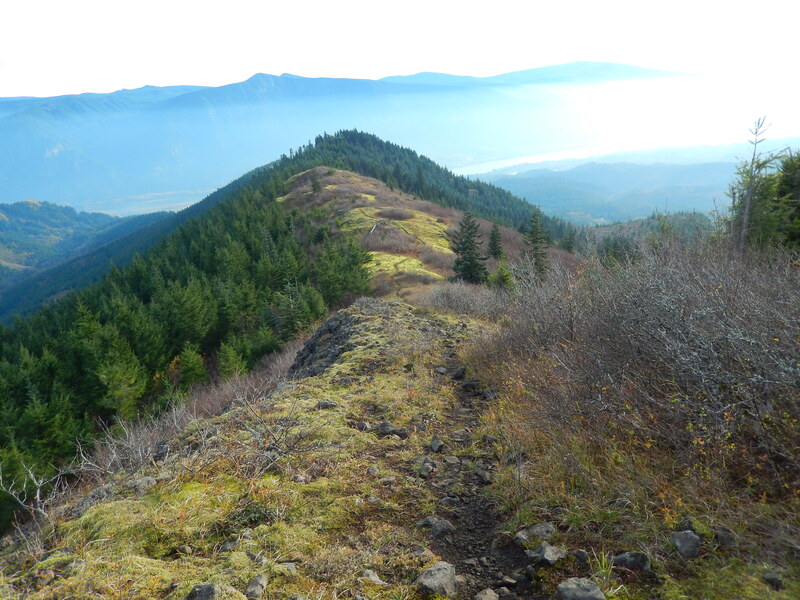 We started up the trail quickly, and I found myself puffing pretty hard. Soon however, Rich started having problems with his feet, and our pace slowed. He taped up his heel and donned different socks, and we continued. Hardy Falls was a nice first stop on the route. 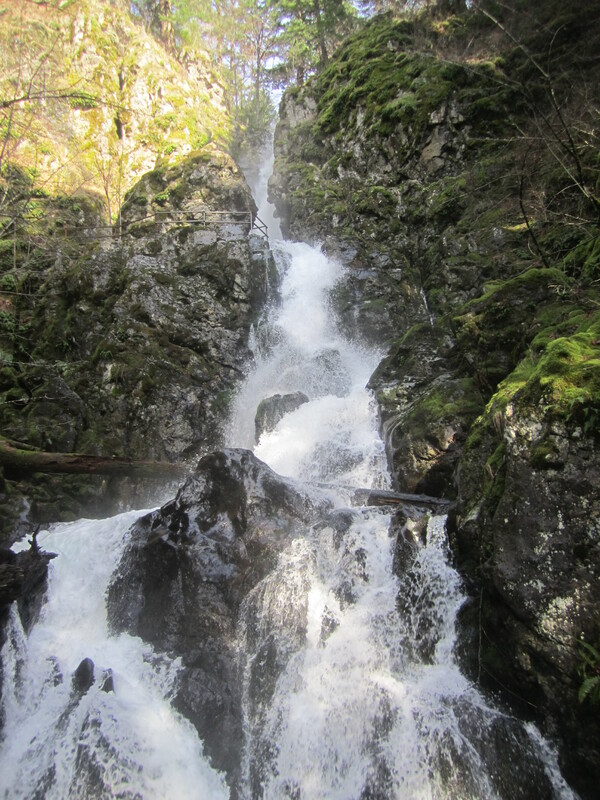 Rodney Falls was above the trail, while Hardy was below. There were multiple platforms from which to take photos, although it was nigh impossible to catch a clean look at the longest drop. The trail climbed in earnest after a junction above the falls. We opted for the shorter route with more switchbacks. 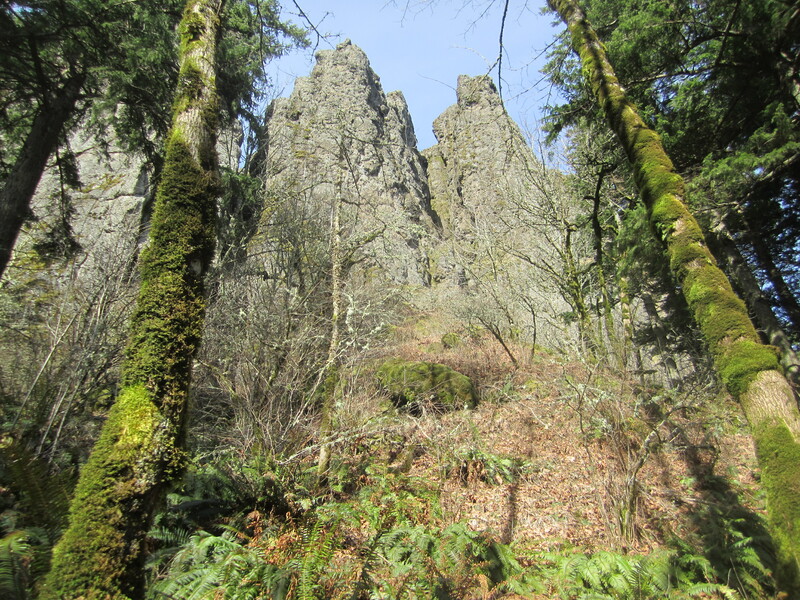 Rock formations soon loomed above, and after some sweat, we were atop a steep promontory surveying the gorge. There were another ten people in the same area, including a woman whose snappy comments to her kids suggested she was afraid of heights. 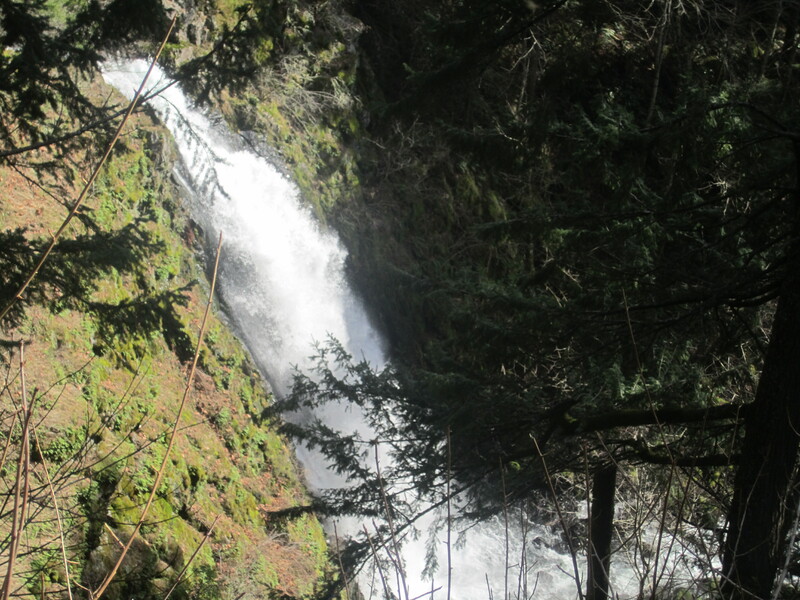 There was, indeed, a long drop if you really took a misstep, but we felt safe. 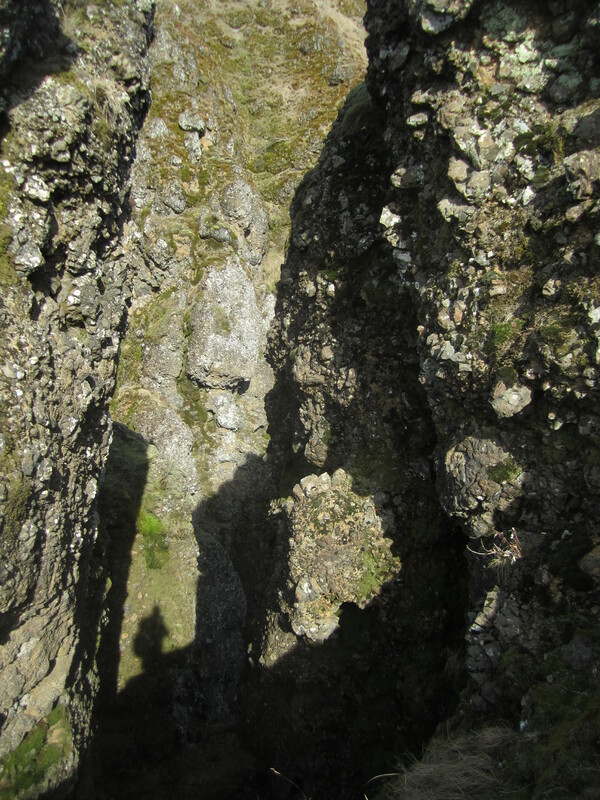 Looking down a narrow cleft. Note my shadow. That spot was spectacular enough to be a destination for the less motivated, but we continued. 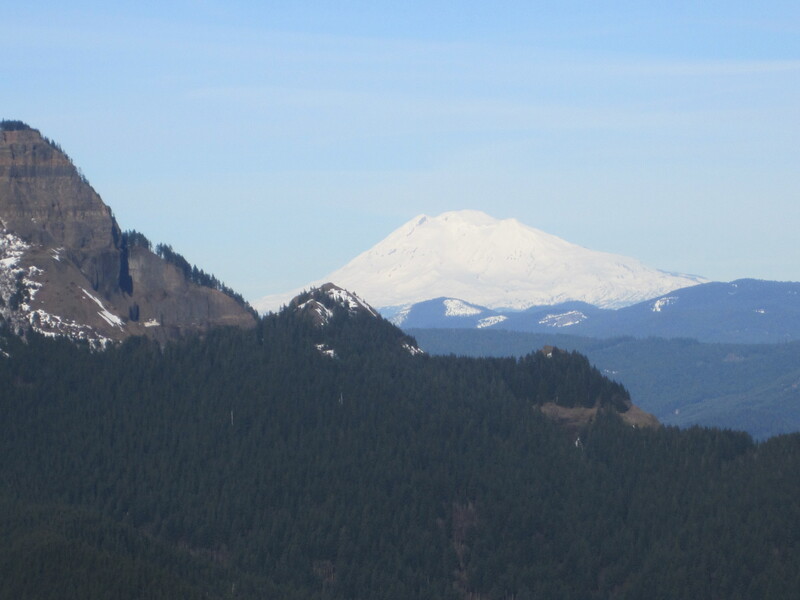 There were more tremendous views, mostly to the south and west. 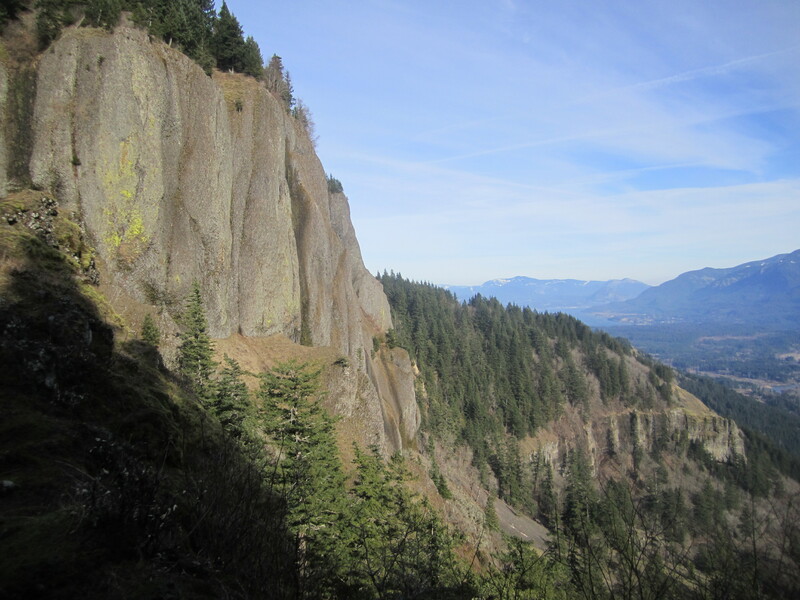 At one point, we stopped for a drink and snack at a grassy spot looking over a steep drop to a mossy talus slope, a second tier of cliffs to the east. 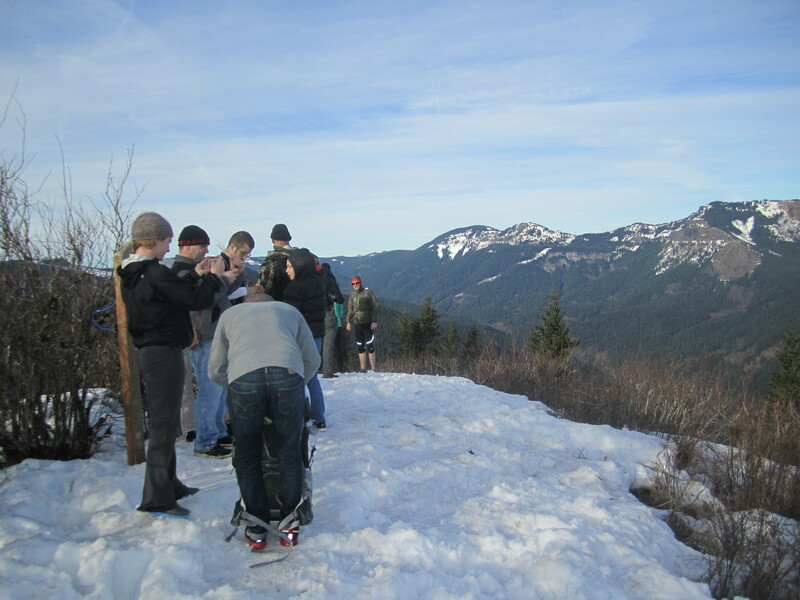 Shortly thereafter, we fell into line with a large group when the trail became intermittently covered in snow. Two runners passed us, the second one of whom wore no shirt. I told him he was an “animal.” He grinned and said “you too.” We both knew better. Still, in five minutes we were all atop the breezy peak. 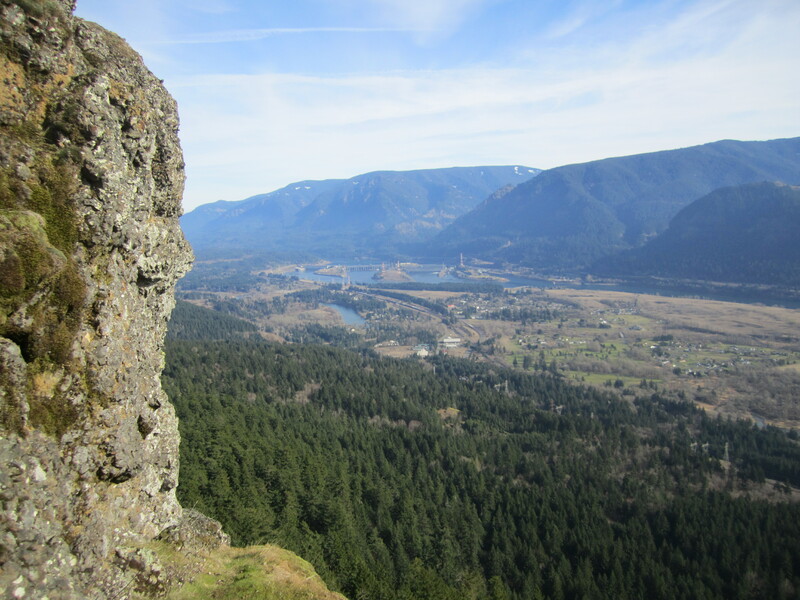 It was crowded, but the views were spectacular, with Adams to the northeast and Hood to the south, the river below, and snow-covered foot hills everywhere, notably Table Mountain and its impressive cliffs. 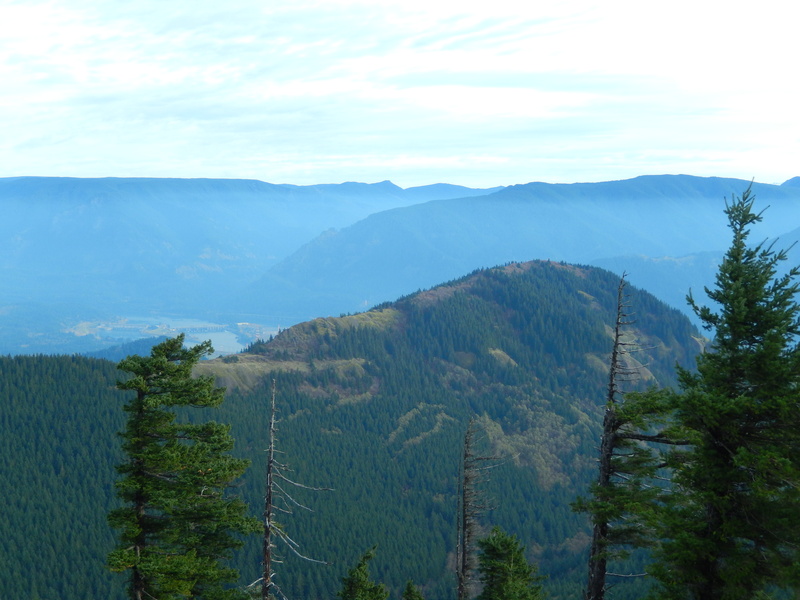 I could see the outline of Angel’s Rest to the west and Wind Mountain to the east, fondly recalling my recent hikes there. The descent was much faster than the ascent, and we joked about how sore our quads would be. 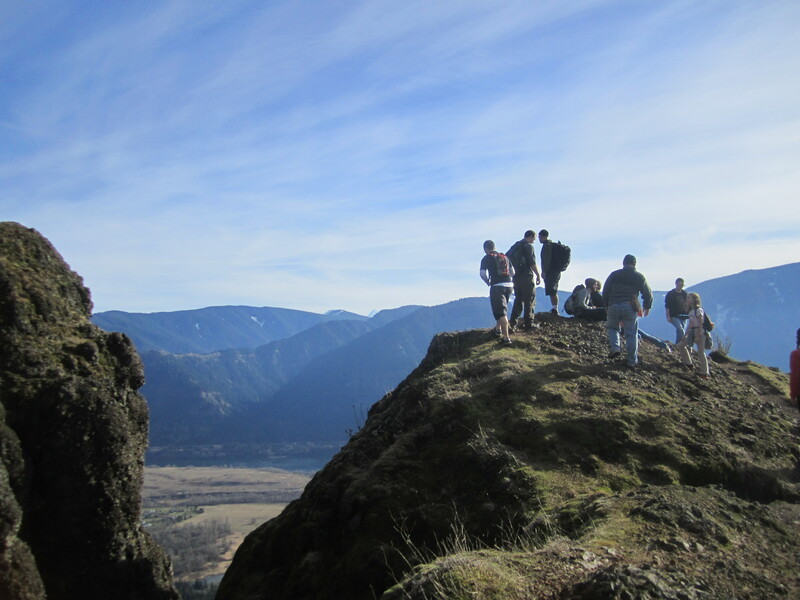 This is a first class hike with unique geological features and truly stellar views, offering weekend warriors a great workout, even when there is snow on the last section of trail. Once back down on flat ground, we stopped for a beer in Stevenson, a quaint hamlet a few miles east. Walking Man Brewpub was jammed, so we opted for the nearby Big River Grill. It turned out to be a fine choice itself, with a fun atmosphere, notable for many old personalized license plates decorating the walls, along with other outdoor memorabilia, such as a sturgeon painting, cross country skis, snowshoes, vintage signs, and a crosscut saw. The Walking Man IPA was delicious, and the sturgeon spread we shared was excellent too. Ahhh. Later, as we headed home to our city lives, I felt very satisfied. Topping it all off as we drove by Beacon Rock was the one of the most spectacular pink and purple sunsets I ever have seen. What a day, and what a place!